Total settlement dollars in 2013 were 60 percent above the average for the prior five years. 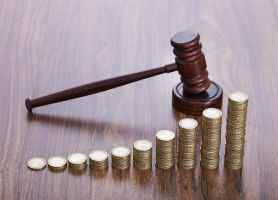 Total settlement dollars from securities class actions jumped by 46 percent in 2013, largely driven by six mega-settlements (those at or above $100 million), which accounted for 84 percent of total settlement dollars, according to “Securities Class Action Settlements — 2013 Review and Analysis,” a report issued Thursday by Cornerstone Research. There were 67 settlements in 2013, up from 57 in 2012 — the first year-over-year increase since 2009, the report found. “In 2013, total settlement dollars, at $4.8 billion, reached the highest level since 2007, driven by both the increase in the number of settlements overall, as well as the increase in extremely large settlements,” said report co-author Laura Simmons, a senior advisor in Cornerstone Research’s Washington office. Simmons said the largest settlements in 2013 were associated either with pharmaceutical firms or financial institutions involved with subprime credit crisis allegations. In contrast, median “estimated damages,” a key measure of investor losses, declined 48 percent from 2012. Since “estimated damages” are the most important factor in determining settlement amounts, this decline was likely a major factor contributing to the substantially lower median settlement amount of $6.5 million in 2013, the report states. The report also notes that the landscape for securities class actions and their settlements may “shift dramatically” depending on the outcome of Halliburton Co. v. Erica P. John Fund, a case pending in the U.S. Supreme Court that could make it much more difficult for shareholders to band together and sue companies for fraud. In 2013, 32 percent of settlements less than $10 million were for cases involving Chinese reverse mergers.